Despite more injuries to the first team squad the Pars won a deserved point against Rangers with "new Dad" Owen Morrison scoring his first SPL goal for Dunfermline. It may only be the second home match but there are signs this injury ridden Pars squad are looking to make East End Park a very difficult venue for their visitors. After a hard battle against Hearts the Pars fought and deservedly won a point against a fairly ordinary looking Rangers side. What a contrast to the weak performance last week at Falkirk with a stirring gritty display against the millionaires from Govan (and their supporters from Cardenden, Lochgelly and other parts of Fife). Scott Muirhead in some early action. The latest injury blow was Greg Shields who may now need an operation on his tweaked cartilage and that meant Phil McGuire dropped back from midfield into his more familiar defensive role. The biggest thing that could be said about McGuire was that Shields was barely missed. 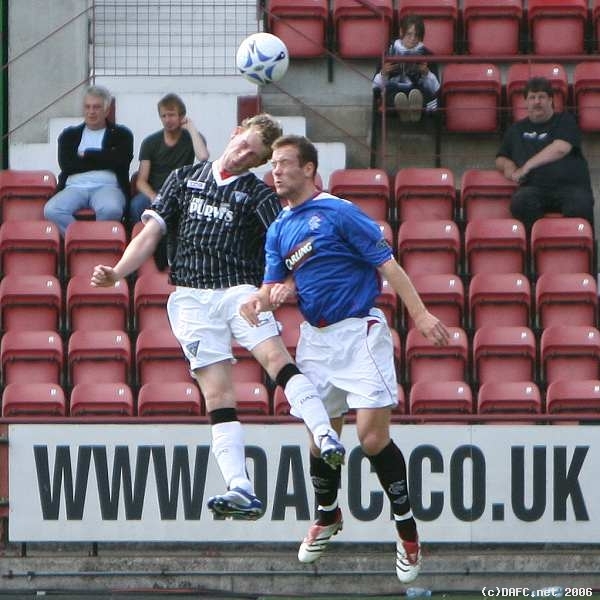 The Pars continued with the 3 5 2 line up with Roddy McKenzie in goals. A back three of Scott Wilson, Phil McGuire and Souleymane Bamba. Calum Woods was at right wing back and Scott Muirhead at left wing back. In centre midfield, Stephen Simmons, Gary Mason and Jamie McCunnie. With Dacquin also out injured Andy Tod returned to the centre forward role and was also captain for the day partnering Mark Burchill. 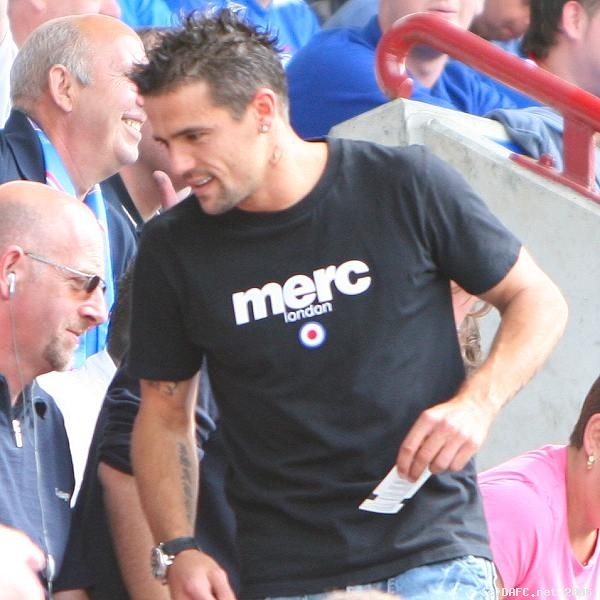 Former wee teamie Nacho Novo takes his seat. In fact, Mark Burchill, the former Celtic player got a lot of attention from the Ibrox boo brigade but he also had a very good chance to open the scoring inside the first minute with a shot from outside the box that had tee’d itself up on his left foot. Rangers were already resorting to the Pars tactics of playing the long ball which was easily dealt with by Wilson and Co. There a couple of half chances for Rangers in 4 and 6 minutes with Buffel heading wide. 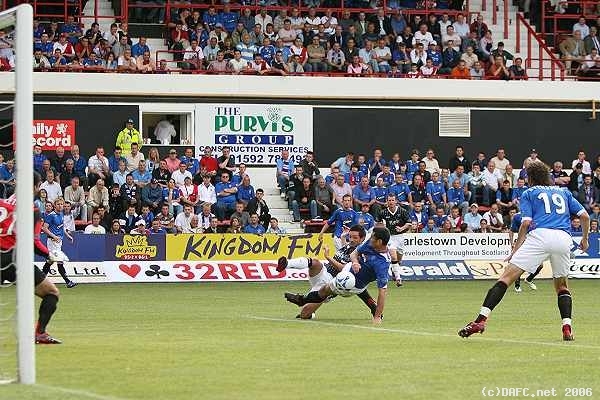 The makeshift Pars attack were causing problems for the Rangers defence and as Tod headed down for Burchill in 11 minutes the diminutive striker was fouled. Simmons hit a good free kick which was saved by Letizi. The game was bouncing back and forward from end to end with Rangers struggling to create any clear chances especially with McGuire and Wilson in outstanding form. In front of the defence McCunnie was also working hard and doing well to keep to Clement under performing. Simmons picked up a needless yellow card for a foul in 33 minutes. Andy Tod then had to go off in 36 minutes with a bleeding head knock only to return just on half time. During that period it was not noticeable that the Pars were playing with 10 men for 10 minutes. Another Rangers free kick in 37 minutes was belted against the Pars defensive wall and then at the other end the Pars almost took the lead as Burchill worked enough space near the corner flag to whip over a cross that Mason just missed in the 6 yard box. Half time 0-0. Gary Mason having a shot on goal. No changes at half time and no doubt everyone in the ground was expecting a Rangers onslaught after a very indifferent performance by them. But the onslaught failed to materialise. Sionko hooked a ball tamely over the bar in 48 minutes. Then it was time for the Pars injury hoodoo to take effect as Muirhead went off injured to be replaced by Greg Ross. Greg Ross comes off the bench and is straight in the action. Rangers then made a couple of changes which the Pars fans were probably dreading with Kris Boyd and Burke coming on for Pro and someone else! Boyd in particular always seemed to score against the Pars when with Kilmarnock but in fact even he was easily kept under tight rein by the Pars defensive trio. If anything, the Pars were guilty of giving the ball away too much often after they had done well to win it. Then the one defensive lapse saw Wilson and Bamba leave a ball to each other as Buffel stepped in to score with a low shot across McKenzie in 63 minutes. It was a complete travesty for the Pars but among the Pars fans there was no doubt a sense of “here we go again”.